It can be difficult to find children's books featuring African American characters, so I'm always happy when I find a new book to share with you. Check out "Tiana Mermaid" a book by Henry Davis. 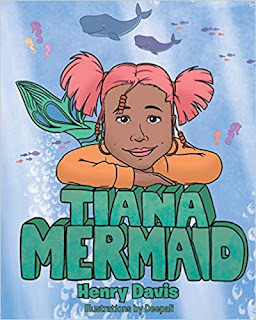 Henry Davis, a New York City-based author, US Marine, carpenter, electrician, and poet, has completed his book “Tiana Mermaid”: an entertaining story introducing a good-natured little mermaid inspired by the author’s own young daughter. Published by New York City-based Page Publishing, Henry Davis’s book is a sweet mermaid tale for young children and independent readers. Readers who wish to experience this engaging work can purchase “Tiana Mermaid” at bookstores everywhere, or online at the Apple iTunes store, Amazon, Google Play, or Barnes and Noble.